AUGUSTA, Ga., July 7, 2016 /PRNewswire/ — Physicians Endoscopy, LLC (PE) along with the physicians of Gastroenterology Consultants of Augusta, are pleased to announce the opening of their newly built ambulatory surgery center—Augusta Endoscopy Center (AGEC). With a growing demand and need for expanded GI services in the area, AGEC outgrew its two-room facility originally built in 2002. On May 23, 2016, AGEC opened its brand new, state-of-the-art three-room facility conveniently located next door to the previous location. The new center, relocated to 393 N. Belair Road, Building 2, Evans, GA, opened one month ahead of its planned schedule. Physicians Endoscopy acquired a minority equity ownership in AGEC in 2010. With a strong partnership and solid track record, the Center has enjoyed successful growth over the past six years. The new facility, developed in conjunction with Physicians Endoscopy, is 6,040 square feet and is expected to perform over 8,000 procedures annually. The eleven gastroenterologists affiliated with AGEC provide both therapeutic and diagnostic GI procedures to the Augusta community. “We were able to spend significant time planning the center. One of the first things we did was visit another Physicians Endoscopy newly built center in Gastonia, NC. It gave us the opportunity to look at it, take pictures, see what we needed, what we liked, and what worked, so that we were on the same page from the beginning,” said Jeff Meyer, Administrator, Augusta Endoscopy Center. “The group originally came to us needing clinical and operational oversight knowing that at some point down the road they would grow and expand. We celebrated over five years with them, and their growth each year has been phenomenal. Over the last year or so, we’ve gone from the ground up. From a vacant lot through construction for a new three-room center. The new building will give them the ability to expand for even more future growth,” said Frank Principati, COO, Physicians Endoscopy. 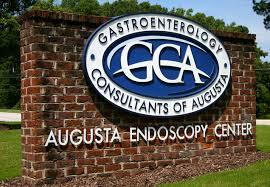 To learn more about Gastroenterology Consultants of Augusta or Augusta Endoscopy Center, visit www.augustaendoscopy.com. Physicians Endoscopy (PE) is the leader in the development and management of GI single-specialty ambulatory surgery centers. For more information about ASC development, acquisition, or hospital joint venture partnerships, visit www.endocenters.com or contact business development at (866) 240-9496.